Mercedes Benz Fashion Week Cape Town. Stop it. There is a reason that Cape Town is one of the most popular tourist destinations… IN THE WORLD. In fact, there are a number of reasons. I have met so many people, from all corners of the Earth, that have absolutely fallen in love with the Mother City and often remarked how lucky I am to live in a city where incredible sights meet unforgettable experiences and the most vibrant people. ‘Table Town’ really is an exquisite part of the world and most often, amidst all the chaos that comes with getting a degree, I find myself indulging in the plethora of treasures the city has to offer. Cape Town is one of those delightful places that allows you to explore, dream and discover a multitude of treats, before you have even left Long Street. One of my favourite things about Cape Town is the way that locals translate and showcase fashion. Style – like class – is not something money can buy, and the people that roam the streets have an unequivocal sense of it. Recently, I was lucky enough to attend Mercedes Benz Fashion Week Cape Town. (Shout out to my RAD mother for hooking me up with tickets). The experience is one in which I will continue to revel, thanks to the scintillating array of clothing and people. I almost died. We – my lovely friends and I – were lucky enough to attend two nights of Fashion Week. The first night we watched Rosenworth and Philosophy at City Hall. We sipped on champagne and posed for a few photos before a slightly chaotic entrance into the show. The runway concept was really quite wonderful, as the girls zigzagged their way through four of the beautiful rooms of City Hall. Both shows hinted at bold patterns and decadent fabrics for the upcoming season. A few local celebrities were there, from the Mayor to Marc Lottering, and photographers snapped away as models and guests showcased some very interesting pieces. After the shows, we headed over to Sevruga for half-price sushi platters, shots and wine. A rather boozy dinner should always be followed by a razzle with wonderful human beings, hence our move to Fiction. A short ,but sweet jol is never a bad thing, especially when you’re dressed to impress. See why I love this place? Exactly. 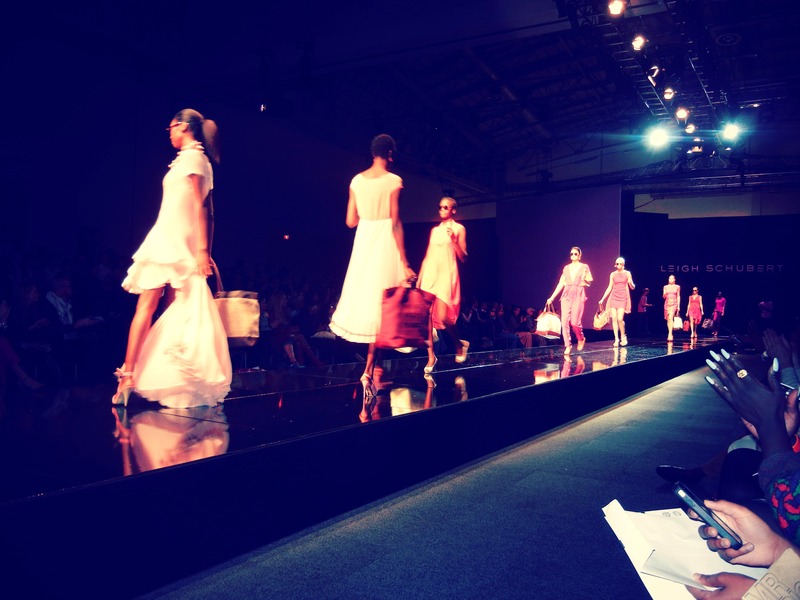 Front Row at my first Mercedes Benz Fashion Week [Cape Town]. Not too shabby. The next night was even more incredible. 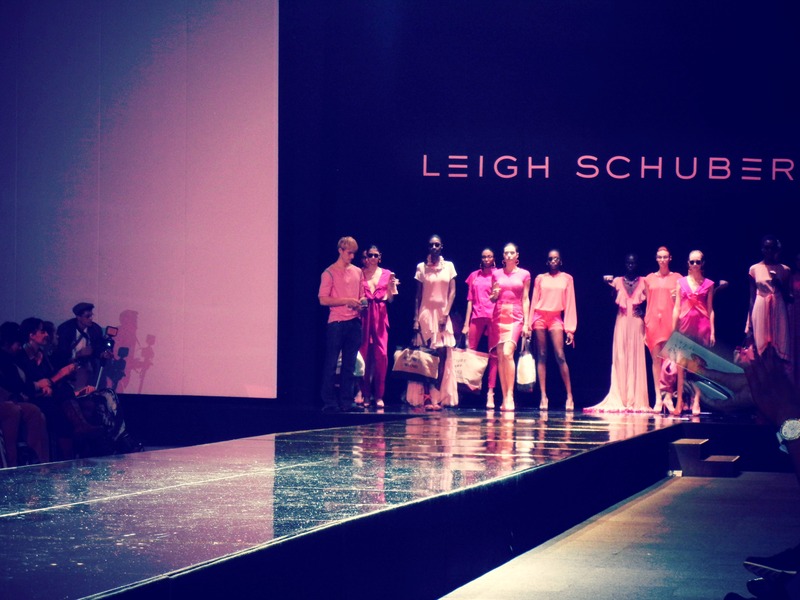 This time we were at the CTICC and sat in the FRONT ROW as media buyers and watched the most spectacular creations make their way down the runway of Leigh Schubert. Coral, Cream and Pastel Pleasures flowed along the catwalk and gave us all a look into what Spring has in store, and I’m not mad at it. The models were absolutely stunning and showcased the most delicious clothes, almost as delicious as the ice creams they carried done the runway. Finale. Leigh Schubert. MBFWCT 2012. Editors, Fashion Directors, Bloggers and Socialites posed, photographed and tweeted throughout the show (I know this because I follow most of them already). The outfits I witnessed were on another level (#chictothenextlev) and I somehow managed to put aside my fear of meeting my idols and introduced myself to the stunning Jackie Burger of ELLE. I’m not entirely sure what I said because I was so busy loving her clothes and the fact that I was talking to a woman I have admired for a large part of my life. Seriously, sometimes I am even jealous of myself. After the show, Nika and I headed to Beluga for another round of sushi – you’d swear we aren’t back at varsity. OOPS. It is nights like these that remind me how beautiful life is and what I want to be when I grow up. I have wanted to go to a Fashion Week event since I was 16 and now that I have, I am making it my mission to climb the lace ladder all the way to Bryant Park. Watch this space. < Previous Summer in Europe. WINNING.